If the circumstances required would they go with the winner on votes or seats? Prior to the last general election, Nick Clegg stated that in the event of a hung parliament, â€œthe party which has got the strongest mandate from the British people will have the first right to seek to govern â€¦ the votes of the British people are what should determine what happens afterwards.Â Whichever party have the strongest mandate from the British people â€¦ have the first right to seek to try and govern.â€Â The consequence, as we all know, was that Clegg sought and formed a coalition with the Conservatives. There was, of course, some wriggle-room in his statement: the right to try or seek to govern is not a carte blanche.Â Even so, with the Conservatives winning most seats, most MPs, most MPs in England (where much Westminster legislation only applies), and gaining a very significant number of seats, it would have taken the turning of semantic cartwheels for Clegg to have backed Labour. 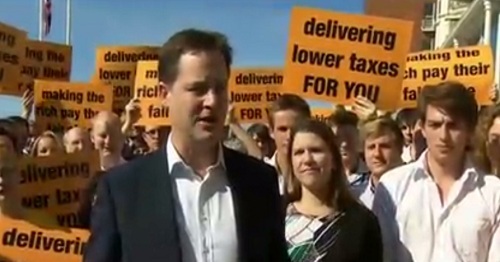 That might not have mattered in the heady days of the Rose Garden press conference when all was smiles.Â A lot has passed since.Â One thing that has not changed, however, is the underlying electoral maths and this provides a problem for left-leaning Lib Dems. As Mike has frequently pointed out, the Conservatives need a far larger national lead over Labour to form a majority government than is the case the other way round.Â It therefore follows that if there is a hung parliament, it is highly likely that the Conservatives will have won most votes.Â For a party wedded on principle to PR (even if these days it might adversely affect them), thatâ€™s a powerful element of the partiesâ€™ respective mandates. Of course, other elements of the mandate may not be so strong: in all probability, a hung parliament would imply the Tories had lost seats and Labour gained them; the Reds might have more seats in total. Â Even so, the inevitable consequence of the Tories having a harder job of winning outright than Labour is that in the event of a hung parliament, the Blues are likely to have the stronger mandate. So are we underestimating the chances of a second Con-Lib coalition?Â There are many in both parties who would prefer to avoid it but the logic that led to the first would still apply: in a hung parliament, the larger party should prefer the certainty of coalition to the risk of being brought down at a time of maximum opposition benefit.Â Whether the smaller would prefer the influence of office or of case-by-case negotiation might be more open to question so is there a third option? There may be.Â The third option would be for the Lib Dems to back Labour if thatâ€™s a viable alternative, whatever the national vote shares.Â To do so, however, would require Clegg or his successor not to box his party in beforehand, as happened last time.